Note: This file might contain other entries for describing routing of mails in your system. You should not edit any of those lines. Certain Sendmail systems are configured with Sendmail Restricted Shell to prevent execution of any third party malicious programs or scripts. 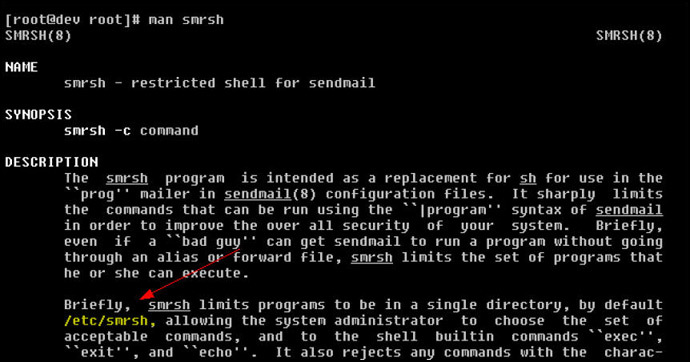 If you receive a bounce message with SMRSH failure then you will need to configure the mail parser with SMRSH in the following manner. Find SMRSH Path: The first step is to find the SMRSH path, run the command "man smrsh" as described below. The path to SMRSH is listed in the second paragraph. By executing the command we now know that SMRSH files should go under "/etc/smrsh". That's it. You have now configured the mail parser with SMRSH. Once the alias file has been edited, you will need to run the "newaliases" command.